The term “theranostics” defines the effort to develop individualized therapies by the combination of diagnostic and therapeutic functions in the same agent. Gold-magnetite hybrid nanoparticles (H-NPs) are proposed as innovative theranostic nanotools for imaging-guided radiosensitization of cancers. H-NPs are designed to exert a dual function: (i) to provide contrast enhancement in magnetic resonance imaging (MRI).and (ii) to enhance radiation effects in the cancer. The imaging and the radiosensitization potentialities of H-NPs arise from the superparamagnetic behaviour of magnetite and the large x-ray extinction coefficient of gold, respectively. Hybrid nanoparticles allows cancer theranostics as the biodistibution of nanoparticles can be tracked by MR imaging, providing a real-time picture of the cancer radiosensitivity profile and allowing precise modulation of radiotherapy. 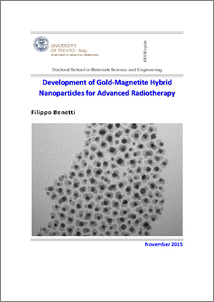 The purposes of this work are to synthetize properly designed gold-magnetite hybrid nanoparticles and to provide preliminary in vitro evaluations about the potentialities of nanoparticles as MRI-contrast agents and radiosensitizers. A novel method for the synthesis of hydrophilic and superparamagnetic Tween20-stabilized dumbbell-like gold-magnetite hybrid nanoparticles was set up. Morphology and chemical composition of nanoparticles were assessed by transmission electron microscopy, x-ray diffraction analysis and ion-coupled plasma optical emission spectroscopy. Colloidal stability and magnetic properties of nanoparticles were determined by dynamic light scattering and alternating field magnetometer. The potentialities of H-NPs for MR imaging were studied using a human 4T-MRI scanner. Nanoparticles were proven to induce concentration-dependent contrast enhancement in T2*-weighted MR-images. The biosafety, the cellular uptake and the radiosensitization activity of H-NPs were investigated in human osteosarcoma MG63 cell cultures and murine 3T3 fibroblasts, using specific bioassays and laser scanning confocal microscopy. The results evidenced that nanoparticles were taken up by cells without inducing any cytotoxic effects, even at high nanoparticle concentration. In addition, nanoparticles were proven to induce osteosarcoma-specific reduction of cell viability in clonogenic cell cultures treated with radiotherapy. The experimental results confirmed the potentialities of H-NPs as theranostic tools for MRI-guided radiosensitization. Further studies are needed to confirm our findings and to identify other potential biological targets for MRI-guided radiosensitization.